Aside from building one of the more successful international companies over the past century, Coca-Cola has also succeeded in creating a boatload of collectibles. The huge variety of promotional items coke has produced over the years include things like bottles, cups, glasses, clothing , trays, bottle openers, toy cars and trucks, signs and puzzles. If you have been thinking of starting a Coca-Cola collection of your own, it can get a little overwhelming, so here are a few tips to point you in the right direction. There is a club called the Coca-Cola Collectors Club that has over 40 chapters in several parts of the world. They have a website where members discuss different aspects of collecting Coca-Cola memorabilia, so you should be able to find out a lot of pertinent information through them. An organized group like the Coca-Cola Collectors Club, other websites such as Ebay and various guides will provide you with the education you need to get started intelligently. One reference book entitled, Allan Petretti’s Coca-Cola Collectibles Price Guide 12th Edition has a multitude of different tips and advice. Since there are so many different collectibles available when it comes to Coca-Cola, narrowing your focus at the beginning may be a good idea. You can’t get it all at once, so choose one category you like such as bottles, promotional cups, stuffed animals or hats and stick with it. Once you get the collecting bug it can really take up a lot of your time and money, so try to set a budget and stick with it. You might feel like this won’t be necessary, but when you come across pieces you’re missing and feel you must have them, it’s easy to spend money you should be spending. A specific collecting budget will help you to keep spending under control and indulge in your hobby at the same time. 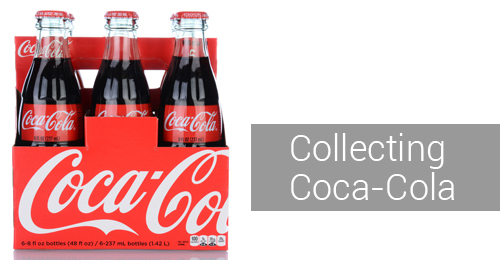 Knowing how to collect and having a budget allotted to collecting are great, but if you can’t find any Coca-Cola items to buy, you won’t have much of a collection. Online auctions are good places to find nice items, and Ebay usually has its share of items available. Antique shops and stores that specifically cater to collectibles will also have Coca-Cola items a lot of the time. Just make sure you take advantage of the current technology and network with other collectors online. This way you will learn and be able to grow your own collection into something very valuable.